DATRON offers a range of sensors meeting individual precision requirements. The DATRON Sensors are more than integrated "measuring systems", they measure and compensate height differences in real time. DATRON's sensor technology reduces the set-up time and the machining results of DATRON milling machines improve considerably. 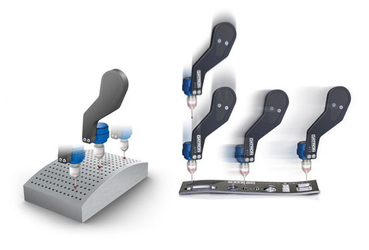 The DATRON XYZ sensors are three-dimensional tactile sensors. Once applied, they significantly reduce setup times of your milling machine. You increase the accuracy and reliability of your references for the workpiece. With the XYZ sensors, your production increases its cost-efficiency. With only one measurement, material edge or workpiece height can be exactly determined. With only three measurements, both the material height and the exact position of a right-angle workpiece edge are analyzed. Advantage: The determination of reference points on workpieces can be done much more precisely with the XYZ Sensor XYZ and in a fraction of the time compared to conventional methods. The XYZ Sensor automatically determines midpoints of circular or rectangular increments or breakouts. Advantage: Precise centring on the workpiece can be done in a few seconds without a long set-up time. With the measurement of two reference bore holes, for example, a nonangled clamping can also be compensated by rotating the coordinate system. The material surface is measured by raster-like scanning. The height profile thus created is corrected immediately by the CNC or engraving programme. Advantage: Machining of uneven or inaccurately clamped workpieces with absolute precision with the correct depth. 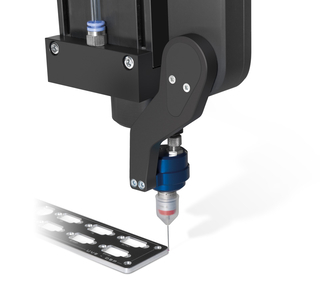 The XYZ Sensor is a 3D sensor and consists of a measuring head with measuring electronics, a swivelling mechanism with precision bearing, and an operating and evaluation software. The sensor is quickly operative for referencing or measuring in every machining phase. This is possible due to the sensor being mounted on the Z axis, so the measuring is effected quickly as the sensor swivels from its home position to the measuring position. Due to a menu controlled software, the XYZ Sensor is very easy to operate. After the measuring is done, offsetting occurs directly in the control without any loss of real time. DATRON offers XYZ Sensors in two accuracy classes. The TP-R sensor, as opposed to the TP-D sensor, is characterised by its higher measuring precision of +/- 0.01 mm. Process reliability is increased with the TP-R sensor as the probing head is fastened to the swivel arm with a magnetic coupling, which disengages in case of exceeding horizontal forces in order to prevent damage. Compared to the TP-R sensor, the TP-D sensor has a lower probing force and offers a higher measurement accuracy of ± 0.01 mm. The TP-R probe head increases the process reliability as it is attached to the housing with a magnet coupling and is moved if the force is too high, protecting the sensor from damage.